Pet Harbor’s 5th annual calendars are now available! 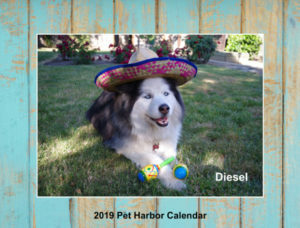 Featuring photos of adopted Pet Harbor Rescue pets, these calendars are only $22 for the 8×11 size, or $30 for the 11×14 size. This year, there are two versions of the calendar — one featuring solo images for each month, and the other featuring collages for each month. All of the proceeds from calendar purchases go back to Pet Harbor. And, they make great gifts! Click here to order the solo photo calendar! Click here to order the collage photo calendar!